In large bowl, stir together yeast and water; let stand 5 minutes. Stir in 1 tablespoon oil and the egg white. Stir in 1 1/4 cups flour blend, the sugar, xanthan gum and 1/2 teaspoon salt. Cover with plastic wrap. Let stand in warm place 1 hour. Generously grease 12-inch pizza pan or large cookie sheet. Place dough on pan. Press into 11-inch circle. Cover; let rise 30 minutes. Heat oven to 425°F. With wet fingers, press dough into 12-inch circle. Bake 10 to 12 minutes or until edges begin to brown. Increase oven temperature to 450°F. In small bowl, stir together tomatoes, 1 teaspoon oil, the garlic, 1/4 teaspoon salt and the pepper. Spread evenly over prebaked crust to within 1/2 inch of edge. Sprinkle with basil and Parmesan cheese. 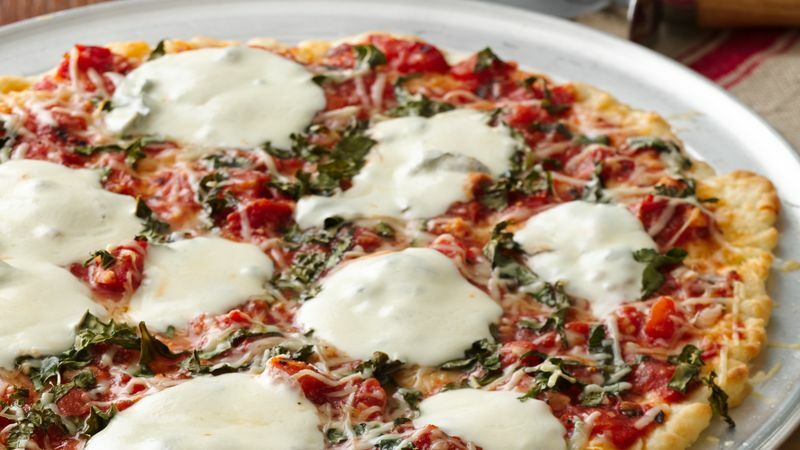 Divide mozzarella evenly over crust. Bake about 8 minutes longer or until cheese is bubbly and edge is golden brown. Let stand 1 to 2 minutes before slicing. Go ahead and use this crust as a base for your favorite pizza toppings—veggies, gluten-free sausage or the works!